Overlooking the village of Chateau d’Oex, this sunny and spacious 2 bed-roomed apartment is in an award winning, renovated 19th Century building, with fine architectural features. The apartments have exclusive use of a modern indoor swimming pool, sauna/steam room, and fitness room. It offers peaceful, comfortable and well-equipped self-catering accommodation for a maximum of 4 people. The apartment has two south facing balconies and a private, large south-west facing terrace with sun awning, offering spectacular views, in all directions. An all year round family resort, the village is set in a beautiful location for all mountain activities. Chateau d’Oex : Is a delightful traditional village, with many amenities, in the French speaking part of Switzerland. There are various restaurants, tea shops, banks, an excellent supermarket and traditional food shops. Also car hire, cycle hire, sports rental, video and dvd rental, etc. There is a cinema, a delightful museum, a helpful, English speaking tourist office and various churches. It is a world-renowned centre for hot air ballooning and every January the International Hot-Air Balloon week is held with a multitude of balloons taking to the air. Traditional Alpine and musical events occur throughout the year. It is an ideal place to relax or be active. Winter activities : Include downhill skiing, cross country skiing, snow-shoeing, tobogganing, hot air ballooning, winter walks, ice-skating, curling and tenpin bowling. Concerts and recitals in Chateau d'Oex and neighbouring villages: check with tourist office. Summer activities : Cable cars are open June to September, giving access to well signed networks of summer walks, and mountain biking. Also skiing at Les Diableret Glacier, cycle routes, horse-riding, hot air ballooning, white water rafting, canoeing, fishing, archery, via ferrata, tenpin bowling, tennis and relaxing! The beautiful Gstaad golf course at Saanenmoser (complete with driving range) is 20 minutes away, also within 45 minutes are golf courses at Lac Gruyere, Villars and Aigle. Also: The Swiss Open International Tennis (Gstaad, July), Montreux Jazz festival, (July), Menuhin Music Festival (Gstaad), Chillon and Aigle castles, Spa towns of Ovronnaz and Yverdon-les-Bains. There is a new Alpine rollercoaster/bobsleigh ride at Glacier 3000. Washing Machines situated on lower ground floor of building. Tumble Dryers situated on lower ground floor of building. Designated Underground car parking space. Fast 50mbs internet provided within apartment. In the apartment, there are two steps to reach the private terrace. Free FAST WiFi can be accessed within the apartment, remember to bring your personal laptop. The building has a lift. For security there is an entry phone system on the main front door. A laundry room is situated on the lower ground floor. Washing machines and tumble driers are provided. There is also a comfortable bar and lounge area with card tables and board games and a small library, where WiFi can also be accessed. In the swimming pool area, there are changing rooms, shower, hairdryer and toilets etc. In the garden there are seating areas, a boule pitch and outdoor chess. A reserved underground car parking space is provided, with enclosed access directly to basement and lift to apartment. Guests will be provided with a copy of the house rules. Low cost flights to Geneva. We are 120 Kilometres from Geneva, 15 minutes from Gstaad, 1 hour train journey to lake side Montreux. The train from Geneva connects with the MOB Panoramic railway, which takes the picturesque route to Chateau d’Oex. 12 hours drive from London. Golf: Within 1hours drive from Chateau d’Oex, there are 4 golf courses, at Saanenmoser, Villars, Lake Gruyere, and Aigle. The nearest, 20 minutes away, and arguably one of the most spectacular Alpine courses, is Golf Club Gstaad Saanenland, a stunning 18 hole course, (par 70, 5305 metres) at an altitude of 1400 metres, and is open from June to October, after the snow has receded. The driving range has a view to die for! In early summer the fairways weave between protected orchids in a nature reserve and alpine meadow flowers and pine woods. Golf de la Gruyere (par 68, 5058 metres) has views over the lake and to the mountains beyond. Montreux Golf Course at Aigle (par 72, 5828 metres), is flatter and easier on the legs. The green fees vary between £30 and £50, depending on the day you play. 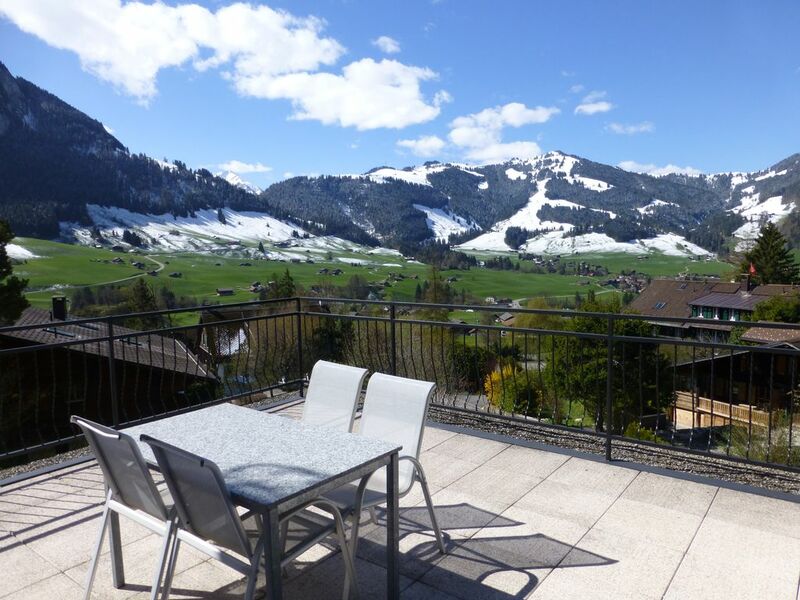 Ski: Chateau d’Oex is part of the Gstaad Superski region, with 250 kilometres of piste, 66 lifts and 6 ski areas, amongst stunning scenery, and including the summer skiing on Les Diablerets Glacier at over 3000 metres. Four hour or daily passes allow great flexibility and the area suits all standards of skiers. Nursery and snow park for children in the village. Excellent cross country skiing at La Lecherette 15 minutes away. There are many designated snow shoeing and winter walking paths in the area. ALL PRICES SHOWN ARE FULLY INCLUSIVE OF FINAL CLEANING AND LINEN. Rates also include free fast wifi, allocated underground car parking space,10% local tax, water, electricity, heating, use of swimming pool and sauna/steam room. £200 or €200 or 200CHF needs to be paid to the Manager upon arrival at the property as a security deposit. This is refunded on departure, provided there has been no damage.